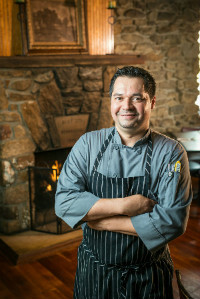 Chef Juan Mujica is so much more than a chef here at Restaurant Village. Although he doesn’t have a catalog of Culinary Institutions to list with fancy credentials, he is a true Renaissance Man. Chef Juan runs the kitchen at The Long Valley Brew Pub where he started as a dishwasher many years ago. As his experience grew in other restaurants and country clubs, he returned to us and today not only runs the entire kitchen, but he is also invaluable to us as general manager as well as property manager at Restaurant Village. Chef Juan’s passion for cooking and life comes through in all of the dishes he prepares with his team at The Brew Pub. He has created a family atmosphere in the restaurant that resonates among the kitchen and floor staff. The Brew Pub is proud to celebrate its 25th Anniversary with Chef Juan at the helm!